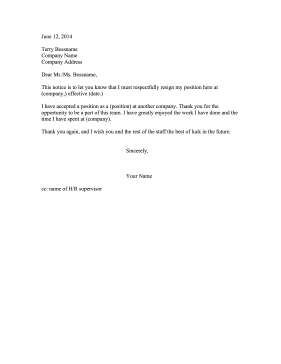 If you've accepted a job at another company, use this resignation letter to leave your current position. This notice is to let you know that I must respectfully resign my position here at (company), effective (date). I have accepted a position as a (position) at another company. Thank you for the opportunity to be a part of this team. I have greatly enjoyed the work I have done and the time I have spent at (company). Thank you again, and I wish you and the rest of the staff the best of luck in the future.